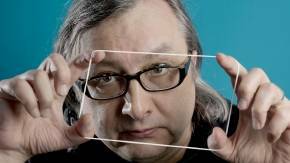 A magician when it comes to imagery; a master of association; one of the most prominent and renowned Lithuanian directors in the world; and a winner of the National Prize for Culture and Arts. His slow movies have enchanted the audience at the Cannes and Berlin film festivals. Šarūnas Bartas is appreciated for his unique outlook on the world and his profound philosophical insight. The film-maker was Lithuania’s first to found an independent film studio, named Kinema, which has introduced several dozen documentary and non-documentary films to a global audience and participants at international film festivals.